Ok, what else do I put on the altar? Traditionally you put bread, fancy pastries, fish, lilies, roses, candles, wine, all kinds of fruit, fava beans, and symbols of St. Joseph (like sawdust) on your altar. To learn more, check out this post at Catholic Cuisine. How did this start? Once there was a famine in Sicily, and the people prayed to St. Joseph for relief. Their prayers were answered, and they made an altar and brought their bountiful food to offer. Then they distributed the food to the less fortunate. So it’s also traditional to donate the food from your altar 🙂 You can read more about this history here. What are ‘fava beans’? They were food for cattle, but everyone was considered lucky to have them to eat during times of famine. Check out the “Fava” bean craft we made! Like our “fancy pastries”? They’re made from fig newtons. See the post on how to make them yourself here! St. Joseph Feast Day Fun! And you can link yours through the end of the month! Sweet, Lacy. A nice bit of icing. : ) I'll see ya over at Evann's! Congratulations on your very first St. Joseph Altar – it is beautiful! Still love those fig newtons, Lacy! Thanks for participating in the blog fest and for all your mentions. Lacy, thanks for your comments. Thanks for the idea on the fig bars, they came out ok. The reason I mentioned about non Catholic readers on my post is because I was away from Catholic church for four years. I have lots of friends that are not Catholic. Lots of amazing Christian friends, some who are protestant. I returned to the Catholic faith two years ago, and since then I have been learning so much, that I never knew before. Thanks to all you. Great job! I love the simplicity of your altar. Your altar turned out lovely, Lacy! Your statue of St. Joseph is beautiful. I noticed when putting ours together today, that we do not have a very nice statue of St. Joseph (it's very old and chipped) and I wasn't willing to pull out the nativity set. lol! Also, the fig symbol cookies you made turned out cute! I came up with something similar last week for my little flowers meeting, decorating Fig Newtons with a bit of frosting to symbolize Bibles/Books. They were so easy and turned out so cute! Wonderful!! I'll have to revisit this again for next year. Also, please stop by my blog for a Sunshine Award! Wonderful to see this! 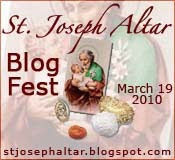 I just wrote a post called St. Joseph: The Greatest of All Earthly Fathers. He really does deserve these altars to honor him! He's help me through some tough times. What a wonderful saint!! God bless you for doing this Link up, Lacy. What great ideas. Your altar looks great! Thanks so much for sharing. This is a great post. I love the information that you give on St. Joseph and all the details. The fig newtons are a new "must" in our family! Momma loves fig newtons and has little other reason to get them! What a neat thing-I had no idea!!! Ours will probably be just as simple-and am happy to see simple ones!